#1 Cause Of High Blood Pressure (Hypertension) - Shocking Facts! Home Blood Pressure #1 Cause Of High Blood Pressure (Hypertension) – Shocking Facts! 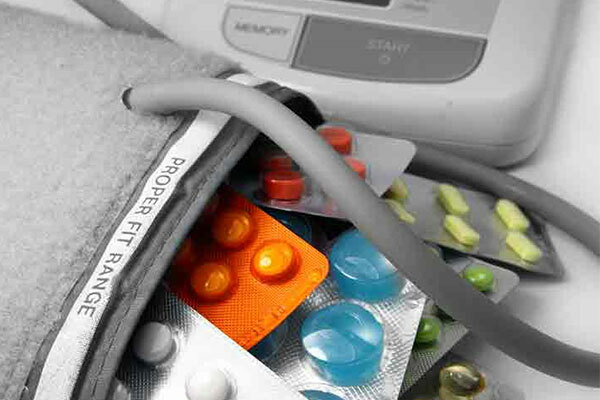 I’ve talked a lot about high blood pressure in the past – causes, and solutions. I’ve done this because hypertension is called the “silent killer” – there are no symptoms for it. Some people think it’s having headaches or being dizzy or something similar – but, it’s not. Lots of things can cause these situations. And of course, high blood pressure can lead to a heart attack or stroke and it’s more of a problem, in my opinion than having “high” cholesterol, if you’re concerned about heart disease. 27% lower risk of mortality overall. Thus, you’re going to live a much longer and healthier life simply by improving your blood pressure, which is a big deal because it can easily be done and you do NOT need drugs. However, today I’m going to reveal the #1 cause of high blood pressure and NO, it’s not your diet, lack of exercise, or stress! It’s because of the negative changes in your hormones, due to AGING! I’ll show you the clinical stats in a bit. However, I know this to be very true because of my own family and especially my parents. And you can get the details below on how I lowered their blood pressure naturally. But don’t go there just yet. 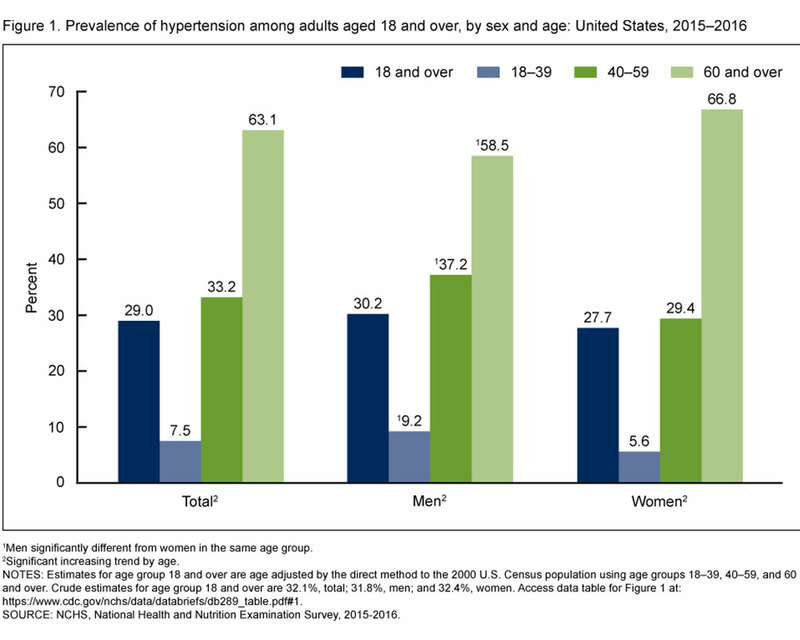 First, take a look at the stats and chart from the CDC (Centers for Disease Control and Prevention) of high blood pressure among adults2 over the age of 18 between 2015-2016. The first bar on the left that’s kinda black, shows the TOTAL number of people who have high blood pressure. Basically, it’s 30% of the population over the age of 18. That’s a lot. What’s worse is that this does NOT take into account PRE-hypertension numbers, which means even more people have “almost” high blood pressure and don’t even know it. So, things are NOT improving. The third green bar shows the % for age 40-59. Men are at 37.2% and women 29.4%. This is a MASSIVE jump, up 420% for men and a whopping 525% for women!!! Because men’s testosterone starts to decline in his late 20s and even more so in his 30s. However, there’s a huge drop starting in his 40s and it’s called “andropause”. 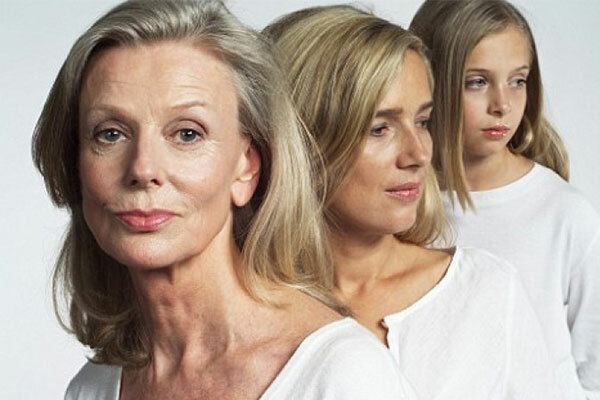 And women start “menopause” in their 40s as well, which causes massive negative changes in all their hormones – estrogen, progesterone, testosterone, adrenal, and thyroid hormones. Finally, the fourth lighter-green bar shows the % for age 60 and over. Men are 58.5% and women 66.8%. Both age groups are significantly worse. But the women are much worse because the negative changes in hormones because of menopause is more dramatic than men’s “andropause”. No, this just means you have to be more proactive about monitoring and improving your blood pressure levels as you age, especially after the age of 40. Now, the best way to find solutions to problems is to know the CAUSE of it. So what you need to do is make some simple lifestyle changes and utilize specific nutrients that a more “mature” body needs, because of the changes in hormones, … so your body can help heal itself naturally, from within. This is the ONLY long-term, safe solution for improving your blood pressure and overall health… and I think you’d agree with this. Unfortunately, Pharmaceutical companies (and most doctors) don’t want to deal with the cause. They just want to “mask” the symptoms with drugs. In fact, this is why there are over 75 different blood pressure drugs with over a dozen different mechanisms. This is also why most people with hypertension end up taking on average 2 drugs AT THE SAME TIME, to make improvements. I know this because both my parents, my aunts, and uncles were dealing with all of these same situations. Of course, if you have extremely high blood pressure, such as 180/120, then you MUST take a drug right away to lower it fast and get it under control immediately. However, even in these extreme situations, this type of person will eventually need to find natural solutions because you should NOT be taking drugs, long-term, for the rest of your life. We ALL know this – it’s just too toxic and they have too many negative side-effects. … ALL affect your hormones and turn genes ON or OFF. Anyway, just because you’re getting “older”, does NOT mean you have to look and feel “old” and deal with the potential health problems… one of them being high blood pressure. First is the formula my dad and mom used to lower their blood pressure naturally. No drugs. No crazy diets or exercise programs: How I Lowered My Dad’s Blood Pressure In Just A Few Days. The second link reveals the 8 best foods that are clinically proven to help lower your blood pressure: 8 Clinically Proven Foods That Lower High Blood Pressure. These solutions work at any age, for men and women.